Poly Panels. This non-corrosive, impact-resistant Poly Panel System is made of 100% recycled material and serves to conceal cross braces and framing material with solid, flat panels to give the stadium a more polished look. Aside from the aesthetic appeal, this system also enhances revenue generation by increasing the ability to affix sponsor/donor signage or logos. 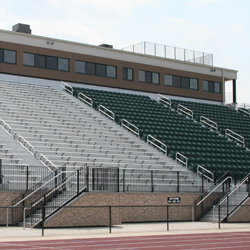 It also promotes safety by eliminating under-bleacher access, and increases function by lowering time and expense of clean up under bleachers. Choose from 10 standard colors.